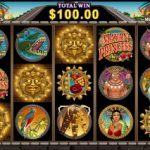 The Maya were a mighty civilization and Mayan Princess is one powerful video slot game from Microgaming. The theme of the game tells the story of one of the greatest empires and celebrates their culture. What we like the most are the brilliant graphics of this slot. Each symbol was carefully crafted and the ending result leaves us speechless. All the symbols are in circles on a beige background and they are all theme related. You can see the dark haired princess, a tiger, sun god icon and what seems like a carving of a red bird. 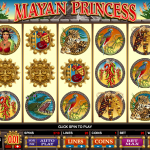 Mayan Princess is powered with special symbols and features just to make this game even more appealing to you. We have a wild which substitutes for all the other symbols in order to complete a winning combination. The wild symbol does not substitute for the scatter only. The pyramid is the scatter symbol and it appears only on the first and the fifth reel. You will receive a random number of free spins and all the wins will be doubled. We would expect at least one more bonus round from a slot like this but then again, free spins round can bring lots of fun too. 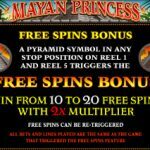 Microgaming has truly outdone themselves with Mayan Princess video slot game. They have many games that have classic status in their portfolio and with no doubt this one deserves to be on top of that list. It is a real treat to look at all those symbols spin and combine not just so you can look at them but also to win some cash prizes on the way too. A very straightforward game with everyone’s favorite feature is exactly what we are all looking for, right? Want something completely different? Lucky Rabbit’s Loot a 5 reel slot by MicroGaming has absolutely unique type of graphics!! !.